Online wine rack retailer, Wine Rack Store, has never been shy when it comes to holiday celebrations. With Saint Patrick's day quickly approaching customers can expect some savings and employees are looking forward to their annual St. Patty's party. Every time a holiday rolls around, customers of Wine Rack Store can expect to find great deals on various wine rack and wine cellar selections and of course discounts on appropriately themed wine charm sets. Even though the traditional holiday season has come and gone, online wine rack retailer, Wine Rack Store, finds reasons to celebrate every month. 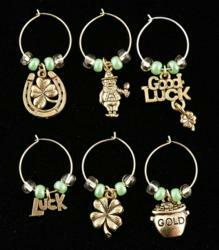 With March 17th quickly approaching employees at WRS are looking forward to their annual St. Patrick's day party and customers can partake in the fun in their own homes with special savings on Luck of the Irish Wine Charms. "We love to have fun on the holidays," said Vice President of Wine Rack Store, Denise Kitson. "It's pretty apparent in our exclusive line of hand made wine charms, I don't think there is a themed set we don't have." Every time a holiday rolls around, customers of the online retailer can expect to find great deals on various wine rack and wine cellar selections and of course discounts on appropriately themed wine charm sets. "I love having wine charms to match each occasion perfectly," said Wine Rack Store Director of Communications, Heather Hoskins, "My guests are always delighted to see which set I'm going to pull out next." Additional to customer savings on almost every holiday of the calendar year, employees of the wine rack retailer always look forward to in-house celebrations. Next Friday will be the company's annual St. Patty's day party. "I'm still in my first year with Wine Rack Store," said Hoskins, "But after a wonderful Christmas celebration, various luncheons and of course hearing about past office parties, I'm defiantly looking forward to spending some time out of the usual work environment with a great group of people."